Today, I read an article titled "Is it safe to let sleeping dogs lie in your bed?" by Dogtime. In it, the author discussed about pet-to-person transmissible diseases like Chagas, Cat Scratch disease, and the notorious Bubonic plague. This made me recall the story my sister once shared with me about a colleague's story of Lyme disease. Honestly, I really don't mind having my dog sleep on my bed. Chooey and Peanuts used to sneak up when I'm asleep. However, being asthmatic, having the dog in my room (but not beside me) is a more beneficial set-up on my part. Training your dog to sleep in his own bed can seem like an arduous task, especially when that cute little face is looking up at you. Therefore, it is better if you teach your dog to sleep on his own whilst he’s a puppy, as it can be harder with a more mature dog. So, what are the benefits of bed training? Some experts believe that it teaches your dog his place in the ‘pack’ or hierarchy in your home. It trains your dog to be alone sometimes, and can guard against separation anxiety. Your tiny puppy won’t stay small for long. 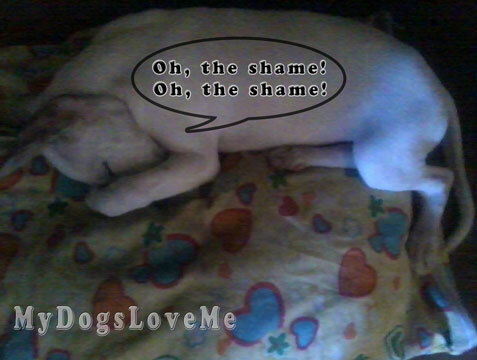 Some breeds can grow to a huge size, and you could be the one with no space in your own bed! First of all think about the type of bed you’d like. Choose one that your dog can grow into, as he will grow quickly. Smaller breeds and puppies do like to feel secure, so a round, donut type bed is a good idea. Make sure that there are no loose edges, or parts that could become loose and a choking hazard. Swell Pets has a variety of different beds you can look at for inspiration. Since Asti doesn't like staying inside a crate, we opted for this type of round bed. It's made of plastic and easy to clean. 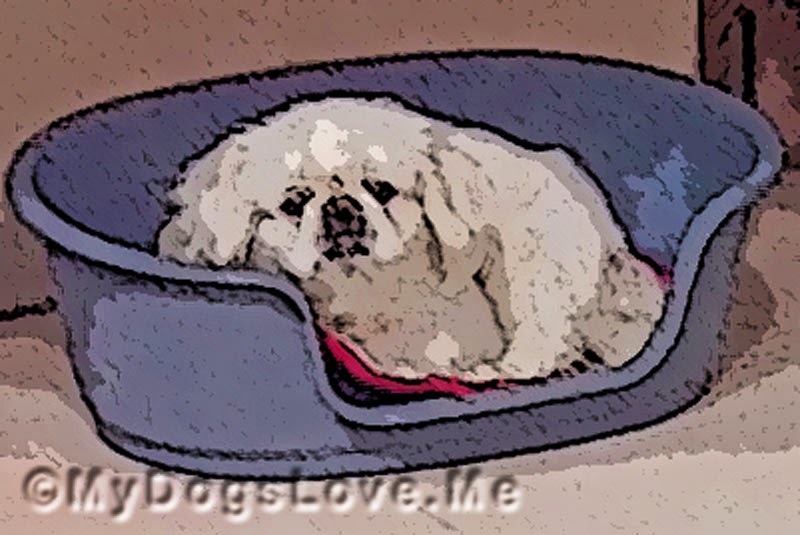 If you have an older dog, or one with joint or mobility issues, consider a heated bed. These can be ‘self-heated’ and work off the dog’s own body heat. Others are thermostatically controlled to a temperature just above the ambient room climate. The gentle warmth will soothe old bones, especially in the colder months. Consider a crate too. More pet owners are using crates to give their dog a place of his own to sleep or just to rest. For puppies this can be a good idea to get them used to being alone and also to save your possessions from little teeth. Before you begin training, remember to go at your pet’s own pace. This will give you the best result and cause the least stress for everyone. Pop an old t-shirt of yours in the bed, this will add your smell to the bed. Also pop one of your dog’s toys in there too to add his scent. This will make the New Bed seem a much friendlier place. Show your dog the bed and let him have a good sniff to acquaint himself. Then place it in the agreed place. This can be in your room, or on the landing nearby if that is better. Wherever you put it, make sure that it is a quiet place in the home that doesn’t have a lot of activity. It needs to be your dog’s retreat, so must be peaceful. And if your dog is this cute, sometimes it's just too hard to say no. If he seems reluctant, pop a few treats in and around the bed. This will help him associate the bed as a positive place and somewhere he wants to be. When it’s time for bed, simply take your dog to the bed and place him gently inside. Saying the word “Bed” each time will help him associate the word with the act. Older pets can be taught to sleep in their own beds, although if they have spent years sleeping with you, this could take more time. Simply follow the steps above, and don’t give in! This video has about 21 million views. It's about the smart pittie who takes advantage of his master's absence. I've seen this a couple of times already, so I definitely want to share it with you. You may experience a few tiresome nights of taking your puppy or dog back to their bed, but the repeated action accompanied by positive words and lots of praise should soon have everyone sleeping soundly – in their own bed! LOL us too...way too late. We too have beds but night time is big bed time. Have a fabulous Friday. Great post, Haopee. I can understand how it would be hard to train a dog who has slept in its humans bed for years to get used to its own bed. That pittie video is hilarious! We hope things are going well with you, dear friend. 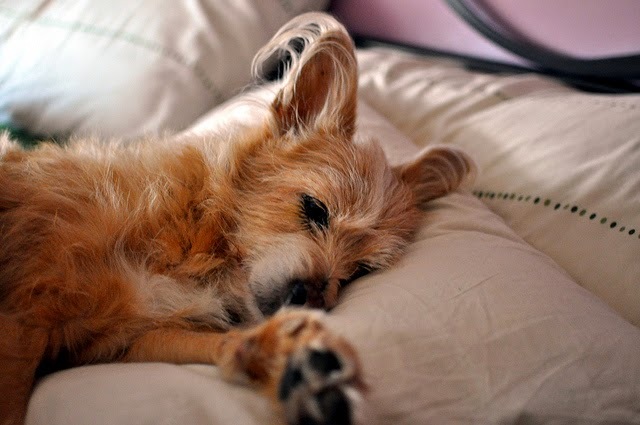 Hi, Great post; over the years we've had dogs of both medium and small size sleep on the bottom of our bed with us. Those dogs all shed and it bothered me, but we still allowed it(I had asthma too). Now, we have a Bichon who sleeps with us, he doesn't shed so doesn't bother me. In the summer, he often sleeps on his bed, but in the winter when it's cold he is right between us. I think this is a decision each person/owner has to make. I understand the philosophy behind not allowing it too. Think about your pet dog's food. 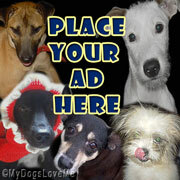 Best healthy pet food reviews are here http://petcaresunday.com/top-5-halo-dog-food-reviews.